Museum Quality, Time Capsule example! This guitar was made at the end of the Fender "bloated" body period that evolved during the 1970's decade and continued into the early 1980's. This guitar represents the last of that production period which ended when Fender brought in Dan Smith, who had previously been working for the Yamaha corporation. 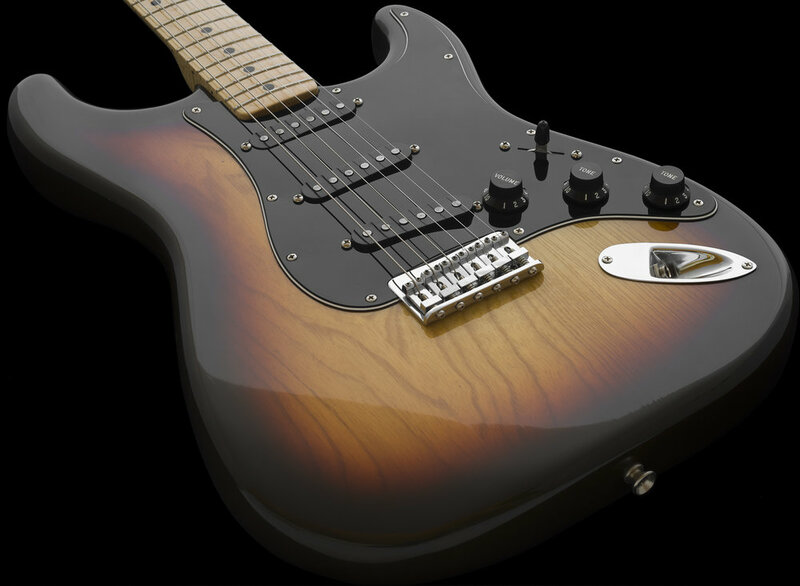 It was then that Fender underwent major model and production changes, which included the introduction of the "Vintage Reissue Series" instruments, a decision that, in hindsight, was quite good. The Vintage Reissue series instruments are still being produced all these years later and may have single-handedly contributed to Fender's rejuvenation, resurrection and the business success that eventually followed, and those models are still driving sales today! I clearly remember the 1980-1981 period and the much-improved instruments that followed in 1982. It seems Fender was forced to evolve or die. The popularity of their instruments had dwindled with the evolutionary, cost-cutting 1970's production changes which turned out heavier, sloppier fitting and ultimately, less desirable instruments. Additionally, pressures were mounting from the competition of their own off-shore manufactured instruments which were finding their way onto U.S. shores, and in comparison, were actually better in several ways than their same period U.S. made counterparts, and they cost less too! Like many large, profit-driven companies, their mission seemed to include making more instruments, making them faster and cutting their manufacturing costs. This was all set in motion in the late 1960's after CBS acquired Fender, and by 1968 had begun implementing their cost-cutting ideas, and the instruments suffered from that point forward, and this is all part of Fender history. With all this being said, there are many collectors, myself included, that like some of the instruments from this era. This particular guitar has been preserved and is a fantastic specimen that is in museum quality, near new condition. The guitar has a 1979 Serial number; however, dating instruments that were produced during this particular Fender period can be confusing as Fender continued using the serialized "S" Logo decals past their designated dates. The dating scheme of "First" letter indicates Year, as an "S" indicates "Seventies", and the number following is "SOMETIMES" indicative of the Year of Manufacture, as an "8" or "9" could indicate 1978 or 1979, however, Fender made so many Serialized Logos that they simply continued applying them to most of the instruments they manufactured up to and including 1982 models. I have examined, tested and set-up this instrument and found it to be 100% correct and unmolested. The finish, electronics, frets, nut, tuners and all of the chrome plated metal and plastic hardware are all correct and original to the guitar. 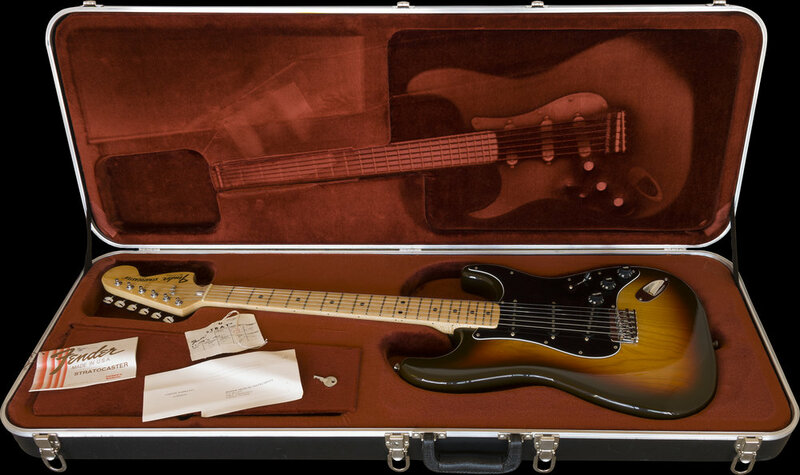 The "Tobacco Sunburst" finish (#525) was 1 of the optional finishes according to the Sept. 1979 price list. The Fender list price was $630.00 for the Maple neck version, without case, which was also $50.00 less than the same model with Tremolo. I have never removed the neck as that would likely damage the finish so this guitar has not been disassembled. I have carefully opened it and checked the potentiometers and they date to 9th week of 1980. I know how difficult it is to find unmolested factory-original instruments, so my approach is to leave them be when they are this virgin. With the exception of lightly cleaning, adjusting and testing it, this is all I have done. The only signs of human contact that are present exist on the pickguard. There are very faint and light signs of it being strummed and played at home when it was bought new, otherwise, I am rating it a solid and conservative 9.5 out of 10 in overall condition. The CASE is Original to the guitar and is also in shiny, clean and matching condition with a functioning handle, latches, and hinges. This is one of the Fender injection molded plastic models and was factory-issued with the guitar. The only signs of usage are just a few minor marks that are present which occurred from occasionally being moved while in my storage. REMARKABLY, even the STRINGS are original. These are the factory-installed Fender Bullet set, except for the high E string which I can see has a regular brass ball end. The thin high E string likely broke and was replaced, but these too were not touched or changed in the name of preservation. I like this Strat and feel it is quite an attractive specimen. The optional "Tobacco Sunburst" was nicely applied over an Ash body and is beautiful in my opinion. I acquired this guitar 28 years ago. I purchased it from a Fender dealer/friend that had originally sold it when it was new, but shortly after that he took it back on a trade, and he never resold it until I acquired it in 1990. Due to its beauty and cosmetic condition, I decided not to offer it for sale and added it to my collection. This guitar is now 38 years old and has been stored for almost 3 decades and is essentially an uncirculated vintage Fender. If like me you are a discerning Fender collector, you might be as enamored as I am with owning a truly original, vintage Fender Time-Capsule guitar. If you have any questions or interest, please inquire.